FAU trails 3-12 overall but is 3-4 in the last seven meetings. Continuing the trend, they went 2-3 in 2017 action. Through 15 of the scheduled 30 league games, the FAU Owls (27-9, 11-4 C-USA) sit in first place, a half-game better than 10-4 Southern Miss and a full game ahead of Louisiana Tech. Tyler Frank is currently slugging at a rate of .627 (3rd C-USA), and has an on base percentage of .467. Fellow Team leader David Miranda, who is batting .343, isn't far behind with marks of .552 and .460 respectively. With two homers last weekend, Cody Wilson joins Frank in a three-way tie for third in the league standings, with eight on the season, and is currently on a nine game hitting streak. Friday night man Jake Miednik is also topping the conference marks with 68 strikeouts (3rd C-USA) heading into the weekend, and leads the league fanning 28 batters while looking. Coming off of a 14-2 rout of Bethune-Cookman Tuesday, FAU has won 19 of the last 25 games they’ve played, and are 5-1 on the road in league play. On the mound, Mark Nowatnick (3-2, 3.00) moves into the Sunday slot for Florida Atlantic, replacing Mike Ruff. Rice had a curfew draw this past Sunday against Middle Tennessee and are actually tied with the Blue Raiders for ninth in the standings. Skipper Wayne Graham has had 38 years of coaching college-age players and the tie was his first as a collegiate coach. The senior duo of Ryan Chandler and Andrew Dunlap both had strong finishes to the Middle Tennessee series. Dunlap went a combined 3-for-5 with a home run. He also had four walks for a 1.200 OB%. Chandler was 5-for-10 over the last two games with a double and a walk. Heading into the FAU series Chandler is fifth on Rice's all-time list for official career at bats with 881. The senior from Houston now needs six more at bats for the next milestone of fourth all-time at Rice (887). In Rice's last seven games Senior Chace Sarchet is now 9-for-24 (.375) with a home run and two doubles (.583 SLG%), ten RBI, six runs scored and three stolen bases. Rice is 3.5 games ahead of where it was at the same point in the season a year ago (13-25 overall record in 2017). Down 10-6 heading into the eighth, FAU baseball would go on to score eight runs in their last two at-bats to take the series opener over Rice Friday night, 14-10. FAU (28-9, 12-4) scored twice in the first, but Rice (16-22-1, 6-9-1) put six across in the bottom of the second. FAU chipped away to tie it midway through the fifth, 6-6, but Rice scored three in their half and another in the bottom of the seventh to once again go ahead by four. Leading off the top of the eighth, Tyler Frank walked, and after advancing to second on a wild pitch, scored on a David Miranda single up the middle. Pedro Pages doubled to put runners on second and third, and Eric Rivera singled in Miranda to make it 10-8. On a steal attempt by Rivera, the ball was thrown into center, cutting it to a one-run game, and Rivera would score on yet another wild pitch to tie it. Then, with the bases empty and two outs, Cody Wilson crushed a pitch over the fence in left for what would turn out to be the game-winner. Three more in the ninth, on a Miranda double with two outs and a Pages home run, was sandwiched in between two scoreless innings by Drew Peden to cement the win. Blake Sanderson pitched the sixth and seventh, with only one run coming in against him. He earned the win, his first of the season against zero losses. Peden’s two innings gave him his second save of the year, as he came in in a one-run game, He allowed one hit and one walk with three strikeouts, including the final out of a game that lasted 4:33. Game two between the Owls and Owls has been moved up to 2:00 PM. Mix and match pitching and we still got the win. This will be a game we look at in a few weeks and realize just how important it was . This conference is tight and every win is important. 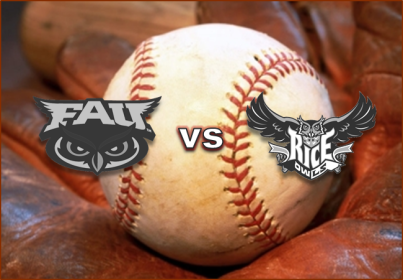 FAU baseball takes series from Rice! A three-run home run by Gunnar Lambert in the top of the ninth inning on Saturday pushed Florida Atlantic baseball past Rice 5-3 to clinch the road series. "Their starter came out and pitched really well, he stuffed us until the fifth, but the guys just kept having great at-bats, just chipping away and battling and battling until Gunnar’s home run", said Coach John McCormack. Rice (16-23-1, 6-10-1) scored three times in the third, but that would be it for the home offense, as Vince Coletti bore down, and three relievers followed in turn. Though Addison Moss retired the first 13 batters of the game, FAU (29-9, 13-4) got one in the sixth – an RBI double by Kevin Abraham – and one in the seventh – an Eric Rivera run-scoring single – to cut it to a one-run game. Jordan Poore was the first call out of the bullpen for FAU, and he got a lineout with two on and two out in the sixth, pitched a 1-2-3 seventh, and was relieved by Drew Peden with two on and two out in the eighth. “It was apparent that Vince didn’t have his best stuff, he gave up three runs in the third, but just gutted it out", McCormack said. "Poore was really good, and Zach got through his inning to nail down the save." Peden then got a crucial groundout to take it to the ninth. Two opposite-field two-strike singles, on an 0-2 pitch to David Miranda, and a 2-2 pitch to Pedro Pages, preceded a fielder’s choice. Then, on a 3-1 count, Lambert clocked one over Rice’s postseason banner in right for a 5-3 FAU edge. Zach Schneider ran into some trouble in the home ninth, but a groundout with the bases loaded clinched a series win for the visiting Owls. The series finale on Sunday will also start at 2:00 PM. I am not one that does this, but today's game was taken away from FAU by a call I have never witnessed in college baseball. Pedro pages rbi double , a call made down the left field line by the third base ump, the correct person to make the call, was over turned after an argument from the Rice coaches. Congrats to the Rice coaches for making history. The rbi was erased, game ended in a 6-6 tie due to travel restrictions. Without inconclusive video review, I have NEVER seen this. Why have three umps? I know these are are paid to be umps and that does not sound right at all. My daughters once hit a line drive to left that the 3rd baseman dove TO HER LEFT to try and stop and the ump ruled THAT foul. And 3rd WAS NOT GUARDING THE LINE, Ouch! 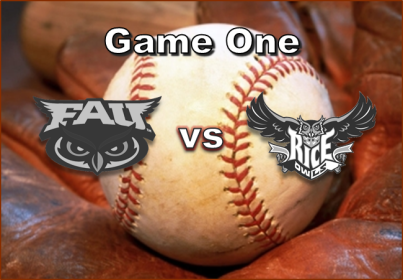 A controversial ninth inning spelled the end of the series between FAU (29-9-1, 13-4-1) and Rice Sunday, with travel time necessitating a game stoppage in the ninth for a 6-6 tie. Even with the draw, FAU takes their fourth straight conference series – and second straight against Rice – after winning the first two games in Houston. “Despite the way the last game ended, I thought it was a good weekend for us,” said Head Coach John McCormack. FAU and more specifically Gunnar Lambert and Jared DeSantolo, pushed out to a 5-1 lead after the top of the seventh. The duo was involved in every run, with DeSantolo scoring Lambert and himself on a two-run home run in the second, Lambert notching a solo shot in the fourth, DeSantolo scoring on an error in the fifth, and DeSantolo singling in Lambert in the seventh. “We had some really good offensive performances, especially Gunnar and Jared DeSantolo today. One thing that we didn’t do all weekend is, we didn’t make an error. We played flawless baseball in the field", McCormack said. Rice (16-23-2, 6-10-2) scored three in the bottom of the seventh to cut it to 5-4, but FAU got one back in the visiting eighth on an RBI single by Cody Wilson. A Rice home run in the bottom of the eighth tied things at 6-6, setting up the ninth. In the top half, with two outs, David Miranda singled off the wall, and on a 1-0 pitch, Pedro Pages laced one down the leftfield line. It was immediately declared fair, scoring Miranda for an apparent 7-6 FAU lead. The call was questioned by the Rice dugout, and after huddling up, the call was overturned to a foul ball. Rice was able to get out of the inning, and the bottom half saw a Rice double and an intentional walk to setup a force-out, but then the game reached the predetermined “drop dead” 4:15 time, with the umpires ending things in a tie due to Conference USA Sunday travel rules. After being held out of Friday's series opener for shoulder tightness, Jake Miednik returned to action on Sunday in relief tossing 2.1 innings, but gave up three runs off of two hits, walked two batters, and struck out two. Starter Mark Nowatnick scattered five hits over his four innings of work, and gave up just one run with two strikeouts and a walk. With the tie Southern Miss takes over in first place atop the Conference USA standings with a marginal .015 advantage in win percentage. Next on the docket is a Tuesday night matchup against Florida Gulf Coast in West Palm Beach. First pitch is scheduled for 6:30 PM, weather permitting. Perhaps it's a case of Male Pattern Blindness, but Appendix E of the NCAA baseball rules covers making the right call, and in no circumstance can I see how that call could have been reversed based upon Rice coming out and complaining. If the ump was unsure, he was to himself seek help immediately. That was not the case as I understand it. Under C), if any other ump is 100% certain he has further information to provide the calling ump, he is to immediately provide the information, but the call remains that of the calling ump. That did not happen. Under D) and E), if not certain, the calling ump is to himself immediately seek help. That did not happen. In fact, E) states explicitly that "He should not have a lengthy discussion with the head coach or others and then ask for help." The first requisite of an umpire is to ultimately get all decisions correct. Umpire pride is important, but never as important as getting the play right. It is the philosophy of the NCAA that umpires always seek to get the call right. This may involve the reversal of a previously rendered decision. However, the correct decision—not the pride of any umpire—must prevail. umpire’s decision, unless asked by the one making it; however, if there is a misinterpretation of a rule, it should be brought to the attention of the umpire-in-chief.” Therefore, except in special situations such as those outlined in the next paragraph, the umpire making the call must be the one to seek assistance of a partner. B) An umpire is urged to seek help when his view is blocked or positioning prevents him from seeing crucial elements of a play. An umpire is also encouraged to seek help in instances when he has any doubt and a partner has additional information that could lead to the proper ruling. C) In the situations listed below, a partner who is 100 percent certain he has additional information unknown to the umpire making the call should approach unsolicited and alert the other umpire to such information. However, the ultimate decision to change a call rests with the calling umpire. Deciding if a home run is fair or foul. Cases in which a foul tip is dropped or trapped by the catcher. Cases in which a foul fly ball is caught or not caught. ball dropped or juggled after making a tag or force. A.R. 1 Umpires may conference, after a batted ball that has passed the first or third baseman on the fly, first touches the ground behind the base and has been ruled foul. After consultation with the entire umpire crew, the Crew Chief will place the base runners where the crew believes they would have advanced had the ball been first ruled fair. The Crew Chief and crew should be conservative on their placement of base runners. after a fair batted ball has been hit into the outfield or on any foul ball to determine whether the fielder did or did not make a catch. Note: If the ball is foul, it remains a foul ball. a) The ball is dead. b) The batter is placed at first base. after a fair batted ball has been hit into the outfield or on any foul ball to determine whether a fielder did or did not make a catch. b) All action prior to the ball becoming dead shall be disallowed. c) The batter shall be declared out. D)Umpires are not to seek help on plays on which they are 100 percent confident in their judgment and view of the play. Head coaches are not entitled to a second opinion when the calling umpire is certain his decision is correct. On the other hand, and contrary to past practice, umpires are not to “die with a call” in cases in which a) the calling umpire is not 100 percent certain he is right; and b) another umpire has additional information that could lead to a proper ruling. Both NCAA philosophy and umpire integrity – consistent with NCAA rules – dictate that calls are reversed in this situation. E) When an umpire seeks help, he should do so shortly after making his original call. He should not have a lengthy discussion with the head coach or others and then ask for help. If the calling umpire seeks help, he should include other umpire(s) who would likely have the best position to see the elements of the play. This conversation must take place away from players or coaches. If a crew chief deems it necessary, he can, at his discretion, bring together the entire crew. All umpires involved should meet at once; multiple meetings unnecessarily delay the game. Crew chiefs can conduct conferences and are expected to ensure that NCAA philosophies are given priority over any single umpire’s pride. A.R. 2 Once umpires have determined a need to conference to review a play, they shall direct the head coach to return to the dugout or coaching box before the crew will begin their discussion. F) Judgment calls, which have traditionally not been subject to reversal, include steal and other tag plays (except if the ball is dropped without the umpire’s knowledge, as discussed above); force plays (when the ball is not dropped and foot is not pulled); balls and strikes (other than check swings). This practice shall continue. Also, some calls cannot be reversed without creating larger problems. Overall, umpires are urged to seek help on reversible plays in which they may have erred by not seeing a crucial element of a play. Such meetings, while necessary, should be infrequent and not become a substitute for umpires seeking proper angles, exercising sound judgment and having the conviction to stay with a call that an umpire believes was properly made. For the record, I was called in on emergency babysitting duty, and was listening in on my phone. My battery died with the 7th run still counting, and no report of Rice yet complaining. Then I came home and saw 6-6 on the game tracker. I thought the StatCrew software had just gone screwy again (last week, on a GDP that was properly entered, we noticed the manual and computer putouts for individual players were different. The guy in the middle, who normally gets a putout and assist was indeed credited with the assist, but was short a putout - he had two on the day and the computer box only had one, and another player had an extra putout. So we checked the two plays where the computer should have awarded him a putout, and it was missing the one on the GDP. It gave a putout to a guy who was not even involved in the play). Then I noticed the twitter feed and saw the call was overturned. Just finished listening to the game. A couple things, the overturn of Pages 2B was indeed in clear violation of Appendix E section E. Just about everyone other in last year's Conference Tournament thought the umpiring was exceptionally hideous last year, with C-USA intentionally tilting the field in Rice's favor.